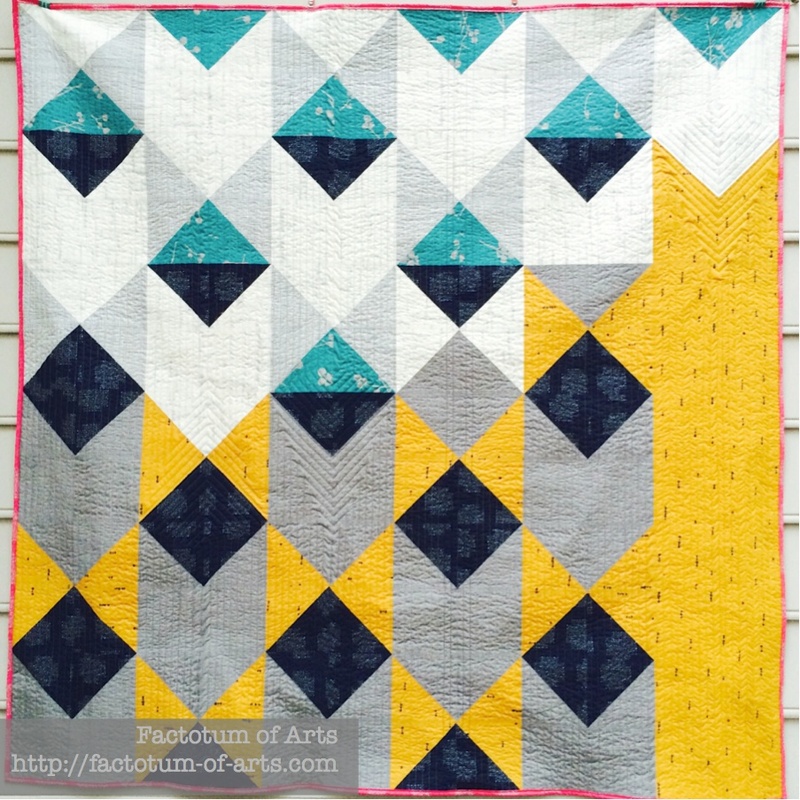 My second entry for the Blogger’s Quilt Festival is my Moorish Pyramids quilt. 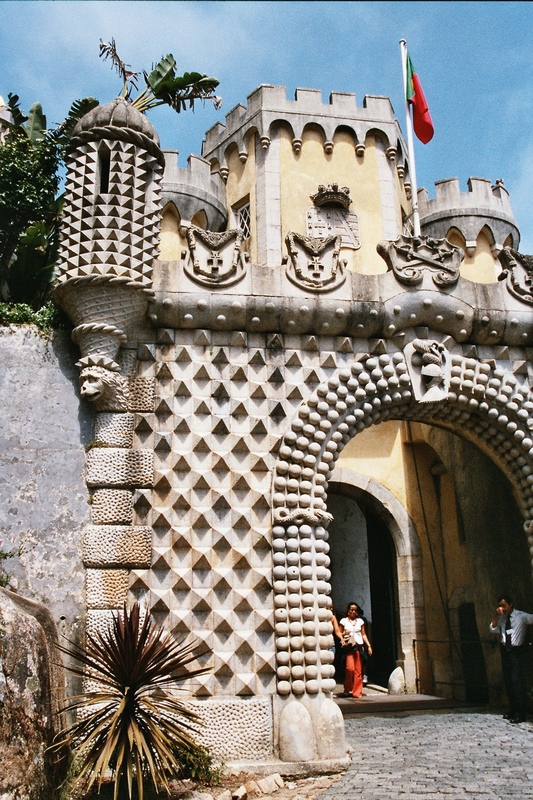 This quilt was inspired by the walls in this photo of the Moor’s Castle in Sintra, Lisbon, Portugal. The pyramid shapes, and how the sunlight exposure and shadows fall is so intriguing. I translated these elements into the quilt. This photo makes me smile every time, as it reminds me of a very unexpected, unplanned vacation that landed up being one of my best vacation’s ever!! Now I have a quilt that captures the memory. The selected a variety of fabrics from Katarina Roccella’s Indelible. I love the grey, navy, mustard and teal combination – my favorite at the moment. When contemplating the binding, the contrast of the bright pink spoke to me. Surprisingly, as I am not a pink person, it’s one of my favorite things about this quilt. The back I pulled in some of the design elements from the front but changed the pyramid shapes into arrows. You can also see the quilting a little clearer on the right. I used straight line quilting mostly, but on rows 2, 3, 6 I wanted to highlight the pyramid shapes a little more. I followed the point of one of the pyramids in these rows, and this gave that cool triangular quilting pattern you see. Quilted: Using walking foot and with various grey Aurifil 50wt threads; Straight line quilting. I hope you all love this project too. Please go and vote and/or participate. You can also nominate quilts for viewers choice award. It’s great to see all the submissions. You’ve chosen two very strong submissions for Blogger’s Quilt Festival! Both certainly deserve to be winners! I hope my vote will contribute to this effect. I liked this when you first posted about it and I still think it’s great. Good luck with the festival! I LOVE seeing real-life inspiration translated into an actual quilt! This is the best way I’ve ever seen of commemorating and remembering a vacation. I keep scrolling through the pictures because I just can’t seem to soak it in enough. 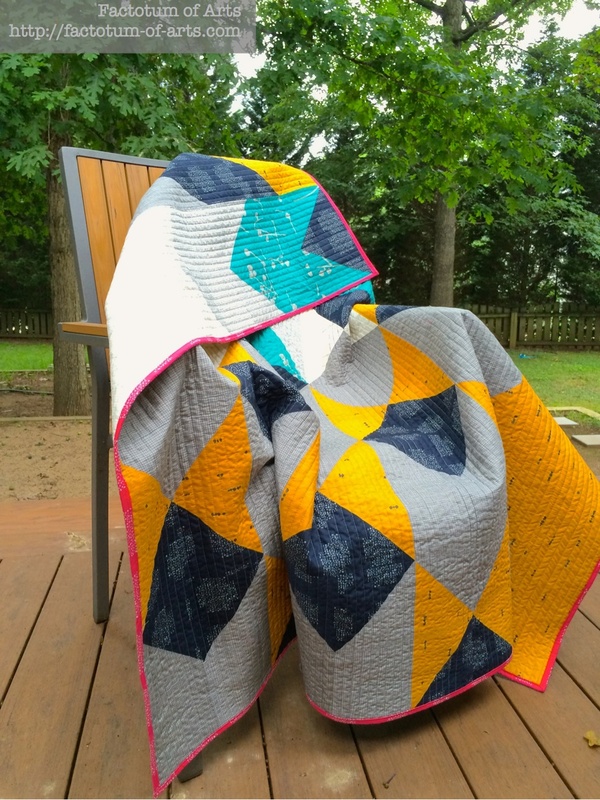 The color choices, the shapes, the quilting. All perfect! What a great quilt. I love what you did for the back too. Great inspiration for a beautiful quilt! We are just home from Lisbon. In the end we ran out of time to visit Sintra, but I can see what an inspiring place it is! Well done! 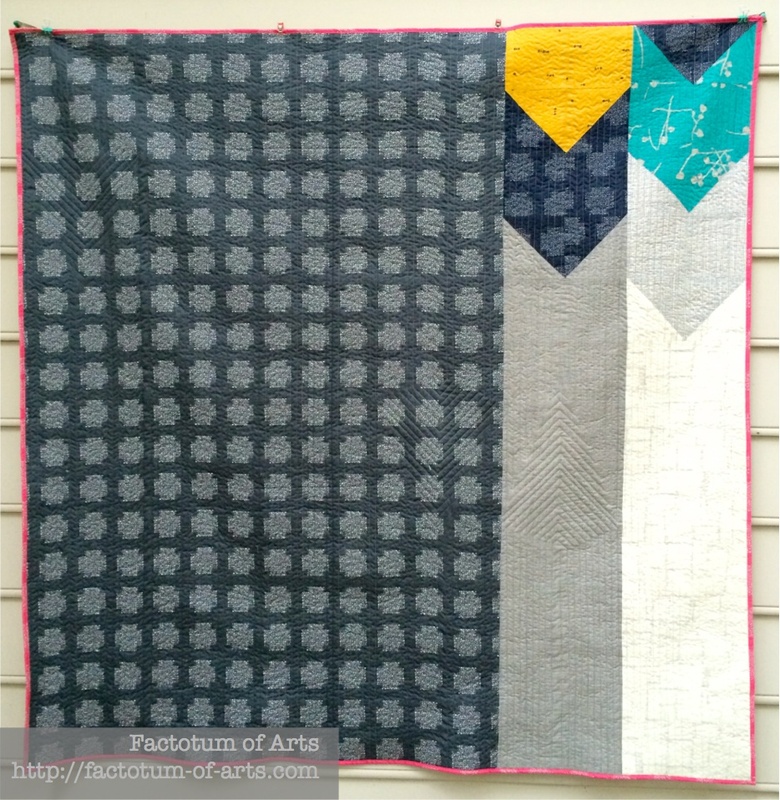 I really like the strong design of this quilt and the inspiration behind it. I am so drawn to the same shapes in the castle that your design pulls from, and I like how the fabrics you selected are bright. I can see the play of light and dark very clearly – this is a neat piece and I love the inspiration photo – I can see how it inspired you – it inspires me too. Very cool. Very intresting and beautiful modern quilt. A beautiful translation. I admire the way that you are able to self edit the design elements of inspiration and create such effective original quilts. I’m not sure I’ve ever seen anything you’ve made that I didn’t love !